It’s hard to have a cheap meal when you are in town because food establishments are usually overpriced there. However, it’s not impossible if you know where to go. Here are my suggestions on cheap places to eat at in Cityhall. Click on the map if you want to view a larger version. 1. 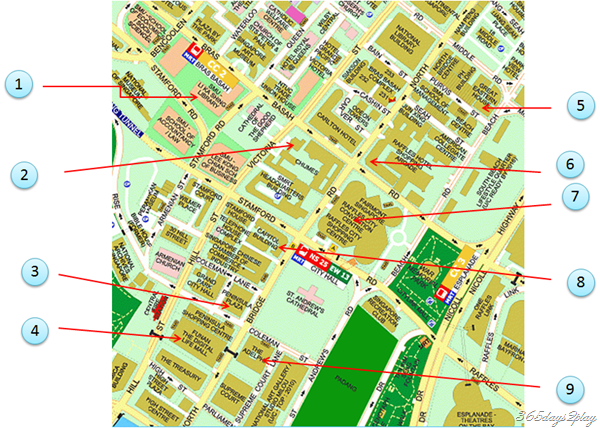 Singapore Management University Koufu Food Court – The map says Li Ka Shing Library, but if you take the escalator down, or if you enter by the Lee Kong Chean School of Business and take the escalator down (both are accessible to the public), you will be able to access the Koufu Food court. Try the coffee at the drinks stall. A kopi costs only $0.80 and a kopi with ice costs only $1.10. They also have coffee bun sets that come with 2 soft-boiled eggs. You can ask for the eggs to be changed to 1 bun if you desire. The coffee bun set costs about $2.30 only! 2. Hog’s Breath at Chijmes – Doesn’t strike as a cheap place to eat, however during the lunch hours, they have a special lunch menu where you can have their signature prime rib set lunch at only $21.90. It comes with a regular slab of prime rib, plus soup and dessert! Now is that a good deal or what? And if you come on Mondays, they have a 1 for 1 promotion. 3. Peninsula Plaza – Once again, if you take the escalators down to the basement, you will find a mish mash of of very affordable cafes. There is a Myanmar cafe, and Indian restaurant, a Thai Cafe and a food court like place but with individual seating areas for each stall….The cheapest thing there as far as I can see is the cai fan (mixed rice) stall. 2 vegetables and 1 meat costs only $2.80 as compared to the Raffles City food court which charges over $4 for the same combination. 4. Funan The Digital Life Mall – There is a Food Junction food court on the 5th floor, with the usual selections. Only problem is, there is no cai fan stall. There are also several other restaurants at Funan, such as TCC, Sakae Sushi, A Roy Thai, Paradise Inn, Bishamon Ramen, but of course these are at restaurant prices and not so cheap. 6. Ah Teng Bakery at Raffles Hotel – Okay disclaimer. This is not a cheap place to eat. However, it is one of the cheaper places to eat within Raffles Hotel, if you want to be seen eating at Raffles Hotel. Ah Teng Bakery, apart from selling some baked goods, actually is a restaurant selling local dishes such as Nasi Lemak, Hor Fun, Lamb Curry etc. These cost more than $10, which means they are local dishes at restaurant prices. And here’s the clincher. The most expensive teh tarik in Singapore! I once had teh tarik at Ah Teng, it cost $4.50!!!! It was a very good glass of teh tarik, and I did not waste a single drop, naturally. Still, $4.50 is okay to pay if you want to “relax” at Raffles Hotel right???? 7. Raffles City – KIV. Will write another post about this soon. 8. Capitol Building – Cheap Hainanese Chicken rice. $5 for Roast Chicken thigh rice with a serving of gizzards. 9. The Adelphi – Hardly anybody goes here without any reason because the Adelphi has mostly hi-fi shops and some spa and camera shops. Tucked right at the back of the 1st floor, there is a tiny store not much bigger than 1 or 2 hdb rooms, selling cai-fan (mixed rice). 2 vegetables and 1 meat costs only $2.80. For the meat, I suggest you select their house speciality chicken cutlet. The food is really very good and tastes like the home-cooked type. I used to come here almost every day. Add a drink and the total cost is $3.50. I heard that the cut fruits sold there are the cheapest in the vicinity. There is a long queue just to buy the fruits. Don’t come here with a big group for lunch, coz there are only 5 or 6 tables there. But people are friendly and will share seats with strangers easily because everyone knows the place is very cramped. Just don’t wear your best shirt here because there can be accidents. « Desperation leads to innovation – When in doubt, eat junk food first!